Just a quick post on the next operation, hopefully the last in a while. When I had the trachelectomy the surgeon put in a vaginal cerclage. 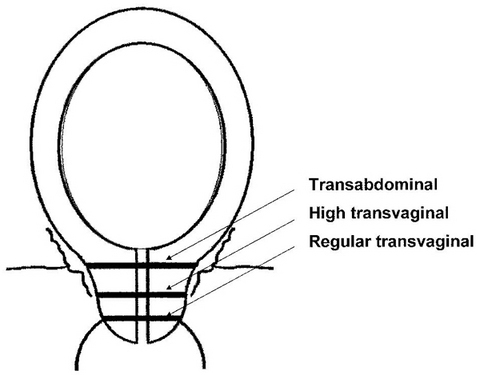 This is a stitch to give additional strength to the cervix and it is placed somewhere roughly where the cervix used to be. During last year when I had the additional operations they decided to remove it as it was causing me some trouble. Once I was confirmed as pregnant, the doctors advised that I needed to get it put back in asap. However this new doctor is a big advocate of the more invasive, but much stronger version that is placed via the abdomen. I was a bit surprised at this but in another way pleased as the success rates seem much better. The doctors will cut down to the uterus, and then stitch in some surgical tape around the base of the uterus/top of the cervix. This surgery is not very common, but has been done on a lot of women who have experienced cervical incompetence for a variety of reasons. It seems more popular in the US at the moment, and certainly more of them have been done than the other surgery I had. Sadly most ladies find out after multiple late term miscarriages, but I know of the risk in advance. The surgery is done much like a C-Section, and will actually be my first open surgery. It can be done laproscopically, but not by my surgeon and the success rates are quite a bit lower (95% vs 75%). Plus this is on the NHS so my choices are more limited! However, I’m really happy to be getting this done, and I’m glad I didn’t have to try and fight for it. 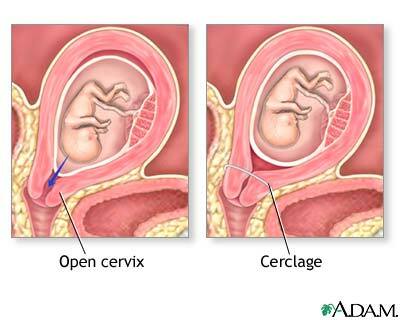 With this abdominal cerclage in place I should have a normal pregnancy, and with the weaker cerclage I would probably need extended periods of bedrest and still lower changes of making it to term. Simply put my cervix isn’t strong enough to hang onto a baby long enough for it to survive. It’s been mostly removed and what is left isn’t visible enough to put the cerclage in vaginally. Once the baby starts to get bigger and put pressure on the cervix there is a good chance it would just give way, and I would suddenly find myself giving birth. This type of cerclage is permanent and will remain for future pregnancies. This obviously means that my cervix can’t open naturally during labour, and so I will be having a c-section. That was always going to be the case as I think my dodgy cervix couldn’t be trusted with the job anyway! Interestingly today I had a scan showing that my cervical length is actually 2.3 cm, which is better than expected. It may be that all the scar tissue that has caused me problems has actually helped by re-creating some of the old structures of the cervix. This makes me slightly wonder if this surgery is totally necessary, but the results are good and the extra security is worth it. I’m headed into Chelsea and Westminster hospital tomorrow (28 March) and will be there for 2-4 days, then back to recovery at home. Under the care of Nick Wales. I’ve been advised to take 4 weeks off work, I think partially to recover from the surgery, but also then to give the cerclage a few extra weeks to 100% heal and gain strength before the baby gets bigger and puts pressure on it. I have to say I am not in the slightest bit apprehensive about this surgery, other than the risks to the baby. The baby will get some of the anesthetic, but it will be proportionate to it’s body weight, as my body will spread everything equally to all the cells, and the baby obviously has less cells. They say the baby will just fall asleep, and will be monitored all through the surgery as well as after. I’ll try not to go crazy on the painkillers after, which is a pity as I love a good opiate! I just want to get this done and get to week 16 with a safe and secure baby, and then have a boring and uneventful pregnancy. The baby is due on our wedding anniversary 8/10/14, although it will probably come earlier. A lovely coincidence. p.s Sorry for all the postings! I’ve been holding back for a while!